The Foundation was established in 1980 on the initiative of and with funds provided by its founder Professor Ihsan Doğramacı, a paediatrician and child health specialist, who signed the Constitution of WHO for Turkey at the International Health Conference held in New York in 1946. Its purpose is to promote and raise the standard of family health by acknowledging individuals who have given distinguished service in the field of family health. The Foundation awards a prize every two years, consisting of a gold-plated silver medal, a certificate and a honorarium to a person or persons, globally recognized for his/her/their service in the field of family health. The prize is presented at a special ceremony during the World Health Assembly. The amount of the honorarium shall be determined each year by the Foundation Selection Panel in consultation with WHO and in accordance with the accumulated interest on the Foundations capital. Any national health administration, the Executive Director of the United Nations Children's Fund (UNICEF) and the Bureau of the International Children's Centre (Ankara), as well as any former recipient of the prize, may propose candidates for the prize to the Foundation Selection Panel. The Executive Board of WHO designates the recipients of the prize on the proposal of the Foundation Selection Panel. 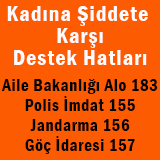 Uluslararası Çocuk Merkezi başvurularınızı 4 Kasım 2013 tarihine kadar beklemektedir.